“However, this desire to belong, participate and contribute to a range of spheres is not always recognised or reciprocated,” the report says. 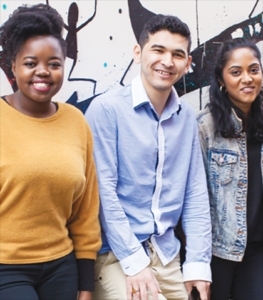 Produced by the University of Melbourne, the report says multicultural young people are incredibly diverse and express their identities and attachments in a myriad of different ways. “Multicultural young people are highly optimistic about the future. However, this optimism declines with age and time spent in Australia… and racism is a key area of concern,” the report says. “Large proportions of multicultural young people are experiencing discrimination, particularly on the basis of race,” it says. “Racism is both experienced and witnessed in public spaces, shopping centres, schools, workplaces, and when applying for jobs. “Racism is experienced differently by different cohorts of multicultural youth, depending on skin colour and other visible markers of race, ethnicity and religion,” the report says. It found that multicultural youth have strong but complex connections to their families. “Most multicultural youth are close to their families and see them as an important source of support,” the report said. “However, these family relationships come with responsibilities and obligations that can create tensions, and are sometimes experienced as barriers to participation in other spheres of life,” it said. The report found culturally diverse young people were engaged and participating in civic and social life of Australia. “Multicultural young people are highly engaged across a range of cultural, civic and social activities,” the report said. “Despite facing barriers and forms of exclusion, multicultural youth are participating in cultural and economic life in ways that strengthen their social networks, affirm their civic attachments, and enrich their intercultural capacities,” it said. But the report points out that while labels like ‘multicultural’, ‘migrant’, ‘refugee’ or ‘CALD’ can be useful in institutional settings there is resistance towards them. “These terms do not come from young people themselves, and risk simplifying young people’s experiences of isolation and discrimination,” the report said. The census – which examines social, cultural and economic indicators that provide data on how multicultural young people are faring– found that nine out ten young people felt confident about reaching their future goals. It found four in five multicultural young people were studying, 49 per cent had experienced discrimination or unfair treatment in the past year and one in five had difficulty meeting transport or study costs or phone or internet bills. The underemployment rate of the respondents in the census was 50 per cent. The study found that gender was a significant factor shaping the experiences of people in the survey. “Females were 3.7 times more likely to feel unsafe walking alone at night than males,” the report said. “Males were also 10 per cent more likely to have a strong sense of place-based belonging – that is, to their neighbourhoods, schools, workplaces and Australia – than females,” it said. The study surveyed 2,798 15-25-year-olds who are either first or second generation new arrivals in Australia.